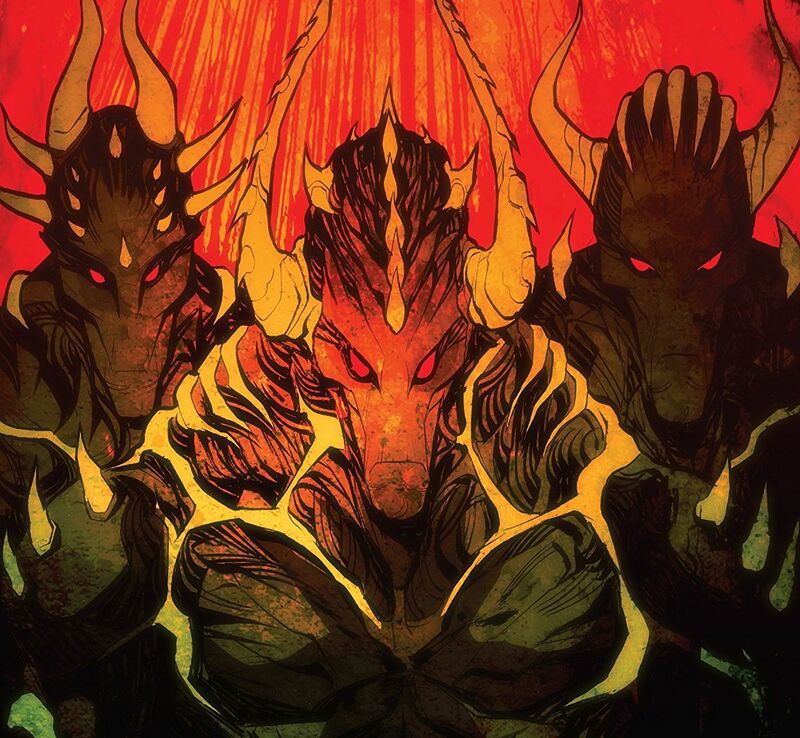 Dark Ark #13 Review – AiPT! The events that unfold directly affect the fate of every single character aboard the Dark Ark, both human and monster alike. Warning: Spoilers for Dark Ark #13 ahead. Dark Ark #13 from from Aftershock Comics is out this week and it will affect the fate of Shrae and his family, as well as all of the monsters that they brought to the new world with them. When we last left the Dark Ark, it had just landed on an island, bringing an end to the long and treacherous journey. For the dark sorcerer and his family however, the peril and danger have only just begun. The monsters and demons that he brought along with him are hungry and, with no further need for Shrae, it is in their nature to devour him and his family as well as all the rest of the humans on board. To make matters worse, as part of the bargain that he struck with the Dark Gods for bringing these creatures to dry land, Shrae had asked to be rid of them along with his dark powers so that he may live a normal life as a human with his family in this new world. Now with no means to protect his family or cure his wife of the vampiric affliction that she took on to save their grandchild, it is not a matter of if but a matter of when the monsters will descend upon them. As the creatures disembark from the ark to explore this strange new land they celebrate their freedom, and for one night it appears that Shrae and his brood are safe, for the time being. The vampire lord Nex only confirms this inevitable doom in spite of their appreciation for being rescued from the flood waters. As the monsters and humans venture around the outskirts of the beach, they are suddenly attacked with a volley of arrows seeming to come out of nowhere striking many of them down in an instant. Suddenly a tribe of tall tribal like Hunters appear out of the brush equipped with Spears and bow and arrows. They savagely and brutally slaughter monsters and humans alike including a member of Shrae’s family. Nex is impaled with an arrow narrowly missing his heart and Shrae comes running to his aid. Suddenly one of the hunters appears and throws a net over the two of them capturing them along with the most of Shrae’s family. The few humans that managed to escape death or capture gather together in the aftermath along with Kruul. The Manticore reveals to them that his mate was also killed in the attack and his newborn cub was captured along with the others. The issue ends with Krull and the survivors planning to find the hunters and rescue their captured companions. The artwork on this issue is pretty spectacular. Juan Doe does a really good job with the action sequences during the attack on the Dark Ark. The hunters in particular look very menacing and deadly. His use of foreground detailing in contrast with the background shadow of silhouettes on the them gives an added layer of depth and dimension as well as a sense of the sheer numbers of Hunters during the raid. The action sequences during the attack feel very kinetic and intense. Another highlight on this issue are the panels where the monsters are leaving the arc to explore the island. There is such a variety of different creatures all together in one area that gives the reader a true sense of the sheer volume of monsters being held aboard the ark for that long. As menacing as terrifying as some of these creatures look, there is a feel of relief and celebration among them finally being liberated out in the open world. Cullen Bunn’s writing on this issue is deep and thought-provoking as usual and does a wonderful job of conveying the revelation and fear that Shrae must face now that the journey is over and his powers are failing. This added element of drama changes everything in the story going forward. Where once Shrae was in control of the situation and the creatures aboard the ark, now he finds himself struggling to do everything within his power as a normal human being to try to save his family from the demonic primal impulses of the very same monsters he is just delivered to salvation. The sudden attack of the hunters throws the story arc into a chaotic whirlwind. Shrae it’s not only faced with the inevitable attack from the monsters that he brought there, but he must now also deal with loss and grief as well as captivity from this new threat of these Hunters. Kruul makes mention that the Hunters attack seemed to be done more with a purpose, rather than just for sport. What this purpose is and who are these Hunters truly are remains to be seen. This issue does seem be rather brief and is over before it’s really begun, however there is a lot to read between the lines and it ends leaving the reader with a sense of uncertainty, mystery, and anticipation for what lies ahead in the issues to follow. Dark Ark #13 is a great installment in this series. The events that unfold directly affect the fate of every single character aboard the Dark Ark, both human and monster alike. Overall this is a must have issue for anyone following this series. There are multiple things that happen within its pages that directly affect all of the characters in this story from here on out in a big way. Situations and events that are pivotal to the story arc. This issue feels like it could have been a little longer in comparison to other issues in the series, however it is dense and rich in its complexity.